This morning at Design Review Committee, approval was given for new awnings and signage at the historic Massey Building (corner Third Avenue North and Richard Arrington Blvd., ab0ve) for a new bank branch for Iberia Bank. While filling a vacant corner storefront is generally good, a bank branch is a lesser replacement for Remon’s, the longtime upscale men’s clothier. After decades downtown, Remon’s expanded to the suburban Summit shopping center a couple years ago and then quietly closed the downtown location shortly thereafter. The bank is lesser because the clothing store had regularly changing, high quality shop window displays. Lesser because good retail is few and far between downtown, while bank branches are ubiquitous. Lesser because, despite the decent new awnings and signage, this intersection loses a local business that made it feel special. A similar situation has occurred across 3rd Avenue at the historic Title Building (above): a longtime coffee shop closed, and was replaced by a short-lived O’Carr’s restaurant franchise. When the restaurant closed, the place was converted into ordinary office space, signage was removed, blinds were drawn, and another hub of activity was eliminated from the intersection. Speaking of ubiquitous, on the SE corner of the intersection we already have another bank: First Commercial Bank‘s branch (above). The remaining corner is taken up by a large entrance lobby for the Concord Center which–while housing some of the best “lobby art” visible from a downtown street–is still an office building lobby. With the architectural prominence of the buildings on this intersection, and their massing which helps define the north-south corridor of Richard Arrington, it’s sad there are now no ground floor uses which engage the public in a more meaningful way. We have recently discussed how Mobile has a program to encourage retailers to come downtown; the state of this intersection illustrates how much our city needs one too. Finally, now that the old “Ready in 2012” signage has come down from the much-anticipated, much-delayed Pizitz Building development, a smaller “Now Leasing” sign has appeared (above). We suspect this heralds a serious new effort by the developer to make this project happen, albeit perhaps in a different form than previously announced. Definitely stay tuned. Chalk it up to the ubiquity of national chains such as Walgreen’s and CVS; to the low prices and convenience of in-store pharmacies at Walmart or Publix; to the poor economy; or to causes less obvious and more mysterious. 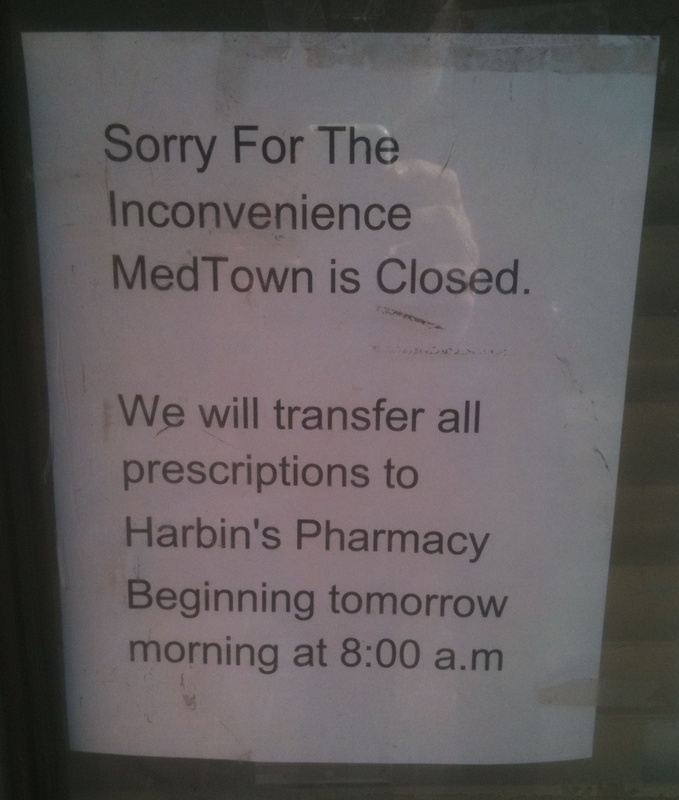 Whatever the cause, or combination of causes, MedTown Pharmacy closed its doors this week. 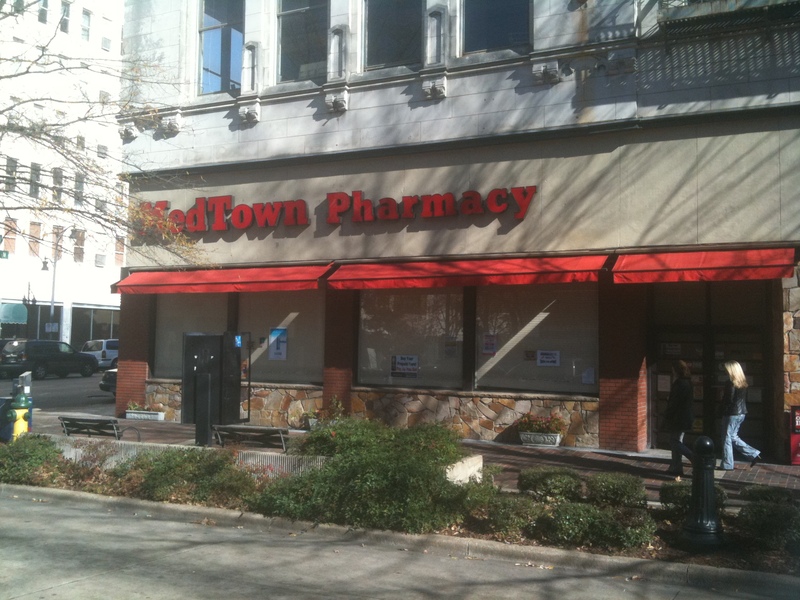 As the sole surviving full-service drugstore on the northside of downtown (within the 200 block of 20th Street North), this comes as a blow to not only the daytime business population in the CBD, but to the many downtown residents (including this author) who chose MedTown as their drugstore of choice. 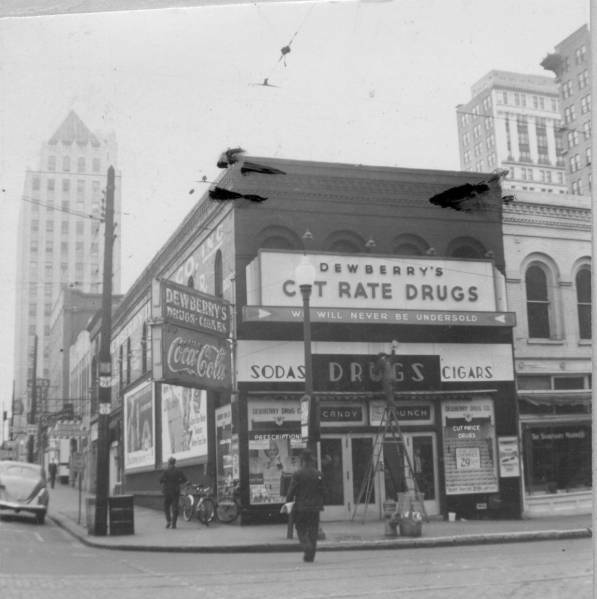 MedTown joins the ranks of other downtown drugstores (such as Dewberry’s, at the corner of 2nd Avenue North and Richard Arrington Blvd., pictured above in 1939) which have closed over the last couple decades. As recently as 1998, there were still 4 independent drugstores operating within a few blocks of MedTown (itself formerly a Big B Drugstore). Now there are none. The closing of MedTown is sadly in sync with the generally haggard feeling of Birmingham’s “Main Street”. 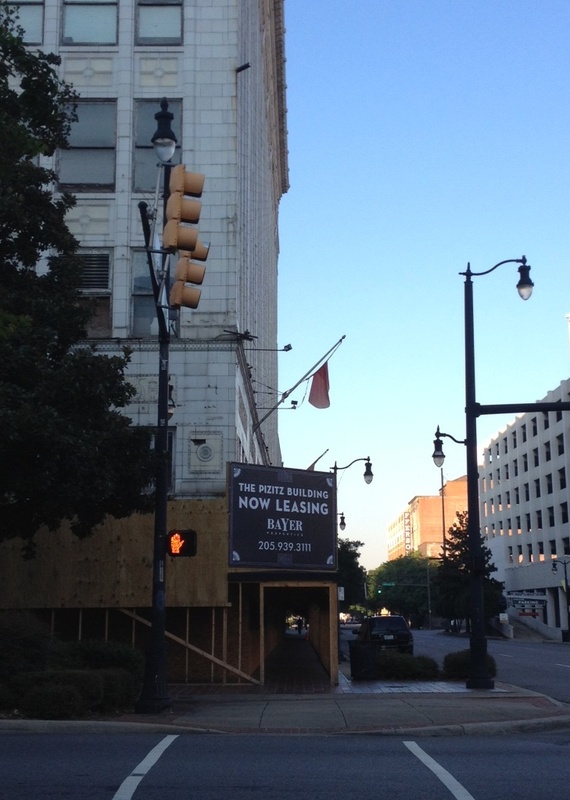 Despite some bright spots–Trattoria Centrale, Brick & Tin, Cafe Dupont, the private residence designed by Appleseed Workshop–recent years have seen the shuttering of the old First Alabama Bank building (and the failure of the proposed Marriott Renaissance Hotel there); the departure of SouthTrust/Wachovia from their 2nd Avenue Branch, leaving an entire half-block of empty buildings; thwarted redevelopments of both the Empire and Brown-Marx buildings; and of course the very, very tired and dated “Birmingham Green” of 1970’s era plantings, concrete benches, and low concrete walls that’s in desperate need of renovation. 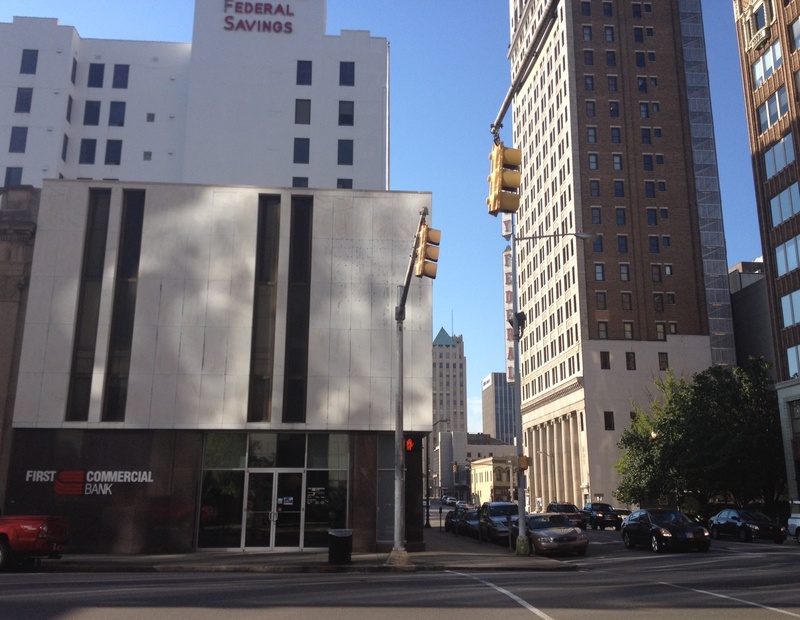 It seems emblematic of Birmingham, in a way, that our “Main Street”, symbolic center of town, has been allowed to become so frayed. 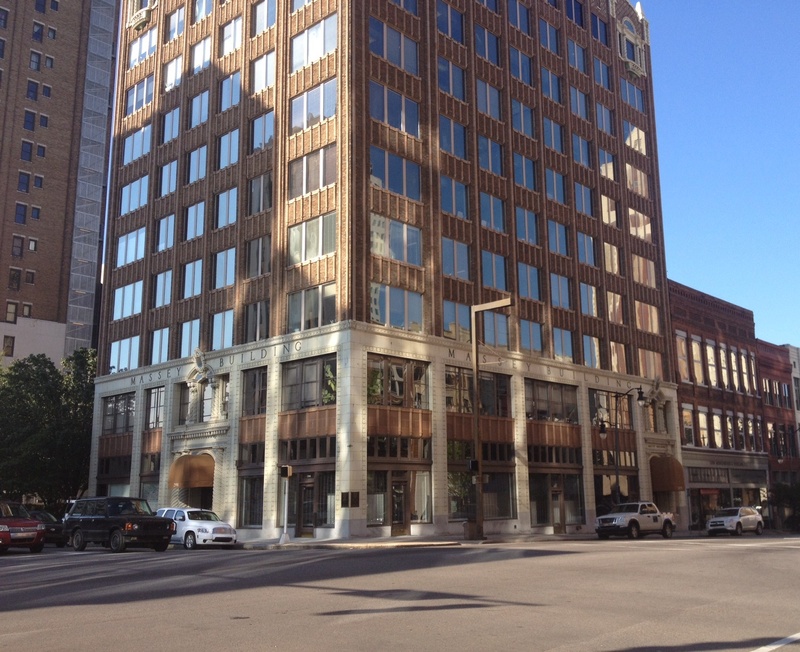 Other areas of downtown are brimming with promise and interest–but the energy dissipates where it instead should be united in full force on 20th. An encouraging sign: I heard members of the Mayor’s staff and the Horticulture department walked 20th Street last week discussing how to overhaul the landscaping to bring it in line with more modern, sophisticated efforts such as Railroad Park and the proposed streetscapes around the Pizitz project. And just seeing the crowds spill out of Trattoria for lunch, dinner, or brunch–no matter how desolate the immediate surroundings–also gives hope. 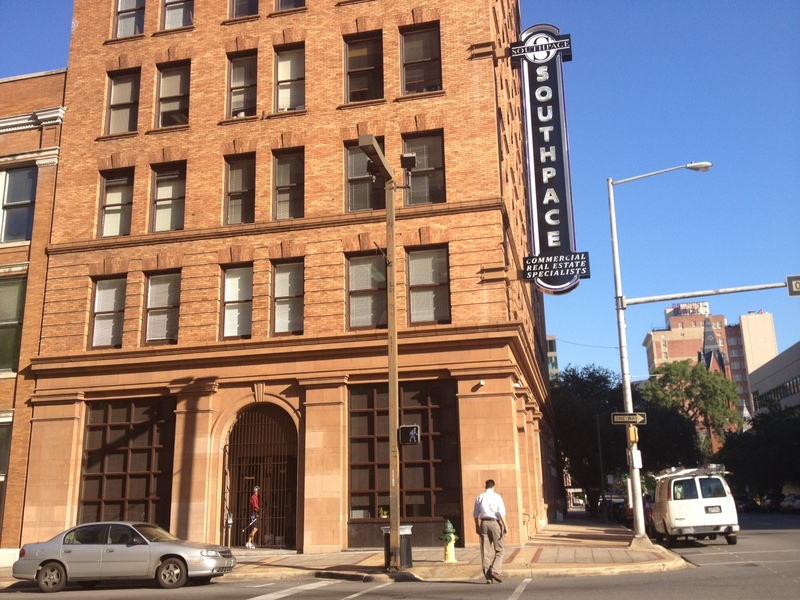 Hope that other entrepreneurs will take initiative to renovate buildings and bring new businesses; hope that the Mayor will continue to search for ways to improve the City; hope that other nearby developments will exert pressure on 20th Street to revive. Of course, some of us also hope that a drugstore will open up in the neighborhood again, and soon.